"They could write like angels and scheme like demons." So begins Pulitzer Prize-winner Edward Larson's masterful account of the wild ride that was the 1800 presidential election—an election so convulsive and so momentous to the future of American democracy that Thomas Jefferson would later dub it "America's second revolution." This was America's first true presidential campaign, giving birth to our two-party system and indelibly etching the lines of partisanship that have so profoundly shaped American politics ever since. The contest featured two of our most beloved Founding Fathers, once warm friends, facing off as the heads of their two still-forming parties—the hot-tempered but sharp-minded John Adams, and the eloquent yet enigmatic Thomas Jefferson—flanked by the brilliant tacticians Alexander Hamilton and Aaron Burr, who later settled their own differences in a duel. The country was descending into turmoil, reeling from the terrors of the French Revolution, and on the brink of war with France. Blistering accusations flew as our young nation was torn apart along party lines: Adams and his elitist Federalists would squelch liberty and impose a British-style monarchy; Jefferson and his radically democratizing Republicans would throw the country into chaos and debase the role of religion in American life. The stakes could not have been higher. As the competition heated up, other founders joined the fray—James Madison, John Jay, James Monroe, Gouverneur Morris, George Clinton, John Marshall, Horatio Gates, and even George Washington—some of them emerging from retirement to respond to the political crisis gripping the nation and threatening its future. Drawing on unprecedented, meticulous research of the day-to-day unfolding drama, from diaries and letters of the principal players as well as accounts in the fast-evolving partisan press, Larson vividly re-creates the mounting tension as one state after another voted and the press had the lead passing back and forth. The outcome remained shrouded in doubt long after the voting ended, and as Inauguration Day approached, Congress met in closed session to resolve the crisis. In its first great electoral challenge, our fragile experiment in constitutional democracy hung in the balance. 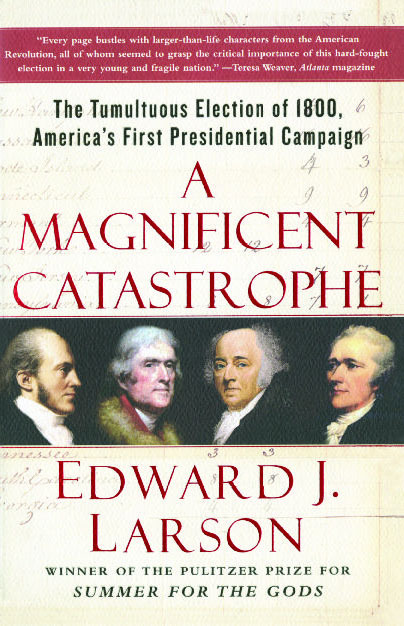 A Magnificent Catastrophe is history writing at its evocative best: the riveting story of the last great contest of the founding period. Edward J. Larson is the author of seven books and the recipient of the 1998 Pulitzer Prize in History for his book Summer for the Gods: The Scopes Trial and America's Continuing Debate Over Science and Religion. His other books include Evolution: The Remarkable History of a Scientific Theory; Evolution's Workshop; God and Science on the Galapagos Islands; and Trial and Error: The American Controversy Over Creation and Evolution. Larson has also written over one hundred articles, most of which address topics of law, science, or politics from an historical perspective, which have appeared in such varied journals as The Atlantic, Nature, Scientific American, The Nation, The Wilson Quarterly, and Virginia Law Review. 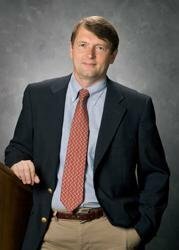 He is a professor of history and law at Pepperdine University and lives in Georgia and California.